Detectives believe that a bloody attack in which a man was stabbed 13 times - after the car he was travelling in was rammed - is linked to the capital's prostitution trade, the Herald can reveal. The stab victim, who is a Romanian national aged in his 30s with an address at a docklands apartment complex, was still being treated at the Mater Hospital last night for his horrific injuries - which included being stabbed multiple times in the leg, body and hands. He was knifed 13 times after a gang of five men jumped out of the car that was chasing him down as he tried to flee in the early-morning city centre attack. The shocking incident happened at the back of the Customs House at 5am yesterday when a black Saab car smashed into the back of a silver Volkswagen Passat at the junction of Amiens Street and Beresford Place. Investigating gardai believe the occupants of the cars are known to each other and all have links to Romanian organised crime gangs involved in the city's lucrative illegal organised prostitution trade. The silver Passat in which the victim was travelling was left in the middle of the junction after the impact, with the black Saab several metres back at the traffic lights. Gardai believe the victim ran from the Passat after the group of five men jumped from the Saab and ran after him and the driver of the car. The victim was stabbed 13 times when the gang caught up with him close to the Famine Memorial on the city's north quays. Blood stains over a wide area of pavement at nearby Custom House Quay indicate the attack was a prolonged one and the victim was moving and trying to escape while being stabbed. It emerged last night that officers also recovered a cash amount from the victim of the attack. He was taken to the Mater Hospital where he was being treated for multiple stab injuries which are described as serious but not life-threatening. He had been the passenger in the Passat which was occupied by one other man known to him, who was driving. The driver of the car, also a Romanian national, gave a witness statement to investigating officers yesterday afternoon. No arrests have yet been made in the case but detectives are satisfied that some, if not all of the five-man gang are Romanian criminals suspected of operating in the prostitution trade. "Investigators are satisfied that this incident is linked to organised criminality involving Romanian gangs, namely prostitution," a senior source said last night. Gardai who responded to the incident sealed off the junction where Amiens Street joins with Beresford Place, leading to traffic chaos. Rush-hour traffic ground to a halt in the area following the incident. Both cars were travelling on Beresford Place at the back of the Customs House when the crash which led to the stabbing occurred. The silver Passat ended up in the middle of the junction of Beresford Place and Amiens Street, a vital traffic artery on the city's northside. There was extensive impact damage to the rear of the Passat and to the front of the Saab. Last night, gardai were still trying to piece together exactly what happened before the shocking stabbing incident played out. Senior sources believe the targeted man in the Passat had been attempting to make his way to his city apartment located nearby when targeted by the men in the Saab. "Gardai have recovered around €650 from the man who was injured in this attack," a source said. 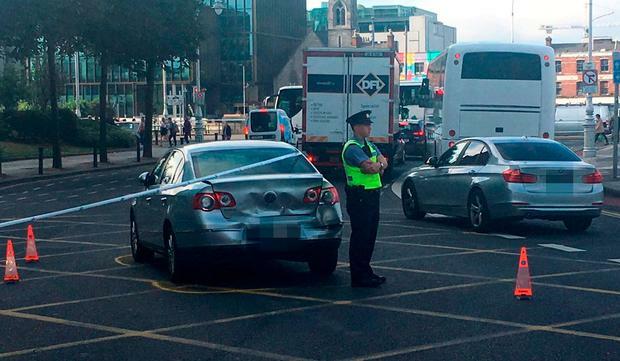 "There is not huge co-operating going on here and gardai are not yet sure if the two men who were targeted by those in the Saab car had been involved in some earlier altercation with the men in the other vehicle," the source added. "However, there is brilliant quality CCTV footage in this area of the city and gardai will be able to trace the movements of all involved in this matter." Organised prostitution remains a major problem in Dublin with a number of Eastern European gangs - including ruthless Romanian mobs - suspected of being involved in the lucrative trade.